British Airways (BA) is the national carrier of the United Kingdom, a subsidiary of publicly-listed International Consolidated Airlines Group (IAG), and is based at London Heathrow Airport with a secondary base at London Gatwick Airport. Using a fleet of wide and narrow-bodied Airbus and Boeing aircraft, BA�s extensive network, including that of franchise partners Sun Air (Turkey) and Comair (South Africa), includes services to Europe, North America, Latin America, Canada, Africa, Asia and Australia. BA is a founding member of theoneworld alliance. By Capa Aviation. British Airways announced that Los Angeles-London Heathrow will be its first route to operate using an Airbus A380 aircraft. Tickets are now on sale for the inaugural flight from London to Los Angeles, which will be on October 15, 2013. In celebration of the announcement, British Airways is offering a special roundtrip fare from Los Angeles, starting at $830 in economy class, and $1380 in premium economy. Club World business class will start at $3,800. The second route to employ the Airbus A380 will be the airline�s London Heathrow-Hong Kong route. 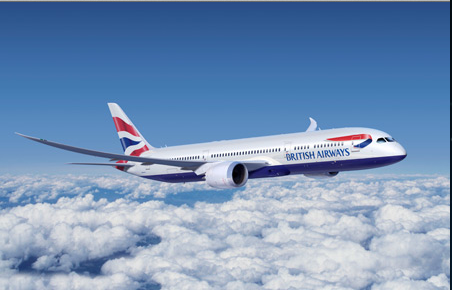 BA will start to serve that route with the new aircraft on November 15, 2013. Once deployed, the A380 will be the largest aircraft in the airline�s fleet. It will be able to seat 469 passengers across its four cabins. British Airways� South Africa subsidiary, Comair, has this week re-launched flights between Johannesburg and Maputo, the capital of neighbouring Mozambique. The airline had withdrawn the service in January 2012 citing low demand and high taxes but, with the strength of the Mozambique economy, has decided to try again. The new service will operate daily with a double daily service on both Tuesday & Saturday that has been timed to provide easy connections for passengers for travellers arriving from London. The route will be operated by 737 with a choice of either economy or business class. Fastjet today announced the launch of their third international destination after Johannesburg and Lusaka, the latter operated by Fastjet and flown in codeshare with Zambia�s ProFlight. From 05th of August will East Africa�s first real LCC operate every Tuesday and Saturday to Harare / Zimbabwe at a cost, subject to terms and conditions of prebookings, of US Dollars 50 per sector, PLUS TAXES AND REGULATORY FEES is should pointed out. Already Tanzania�s number one airline in terms of passengers carried, does the third international destination also put Fastjet to the top of countries served from Tanzania, outpacing the competition which has invariably withdrawn from Johannesburg, Lusaka and Harare over the past years. The news broke in a timely fashion as Fastjet is presently participating in the Routes Africa conference taking place incidentally in Victoria Falls where the carrier is represented by Mr. Richard Bodin who was recently appointed to the board of Fastjet PLC, a publicly listed company in the UK and the umbrella for the African operations. Zimbabwe�s Transport Minister was quoted from the sidelines of the Routes Africa conference as having said: �The Government of Zimbabwe is delighted that Fastjet is expanding its international route network to include Harare and that in doing so is bringing its low-cost, reliable and safe service to the people of Zimbabwe. Fastjet�s entry into Zimbabwe demonstrates the Ministry of Transport�s on-going commitment to the improvement of our country�s aviation industry and to the development of trade relationships with our neighbours. We look forward to continuing our discussions with Fastjet regarding the airline�s further expansion in Zimbabwe�. The closing comment could indicate that once operations by FastJet in Zambia have commenced, that flights to Victoria Falls may also be on the cards at a future time, either from Dar es Salaam or from Lusaka.